Out of all the lovely presents Santa brought me this year, my favorite was the Voluspa Creme Candle gift set. Packaged in a gorgeous maroon and cream patterned box, this delightful collection of glass encased votive candles instantly brought a smile to my face. I have always seen Voluspa candles in high end bath shops and spas, but for some reason had never purchased them for myself. I'm not sure what I was thinking (or smelling, rather) but these clean burning candles provide a powerful and sensuous fragrance while they burn and long after they flame has gone out. I am usually highly picky with home scent, particularly with candles, so that is also why I was so surprised that each and every one of the ten scents appealed to me. Sawara Cypress- currently burning right now- it has an exotic, peppery scent... love it! Vanilla Jasmine Tabac- the tabac adds a slight masculine edge to the otherwise feminine scent. Whichever way you look at it, Voluspa Creme Candle gift sets are a decadent treat! With Christmas rapidly approaching, I can't help but feel excited about the festivities and good cheer that are (hopefully!) on the way. This year, with the current economic crisis, the Christmas festivities have not been quite as festive as Mr. Fezziwig's ball from Charles Dicken's A Christmas Carol. No, that would seem too lavish and perhaps inappropriate. But they also have not been of the Bob Cratchit variety either. This year, the best Christmas gatherings meet somewhere in between... a little glitz and glamour mixed with the good cheer of quality time spent with close friends and family. On Monday, I will have the pleasure of attending a gingerbread house party. My good friend N and I have lofty ambitions of making a show stopper gingerbread house, complete with flying buttresses and gargoyles! But perhaps the main thing that is having me rub my hands together in delight and anticipation is the feast on Christmas day: Roast goose with pate and prune stuffing and all of the trimmings (a recipe straight from The Two Fat Ladies). This feast is not being prepared by me, but by my family (all the more reason to enjoy it!) I am in charge of the dessert. I'm thinking homemade apple pie... with a gorgeous, golden and flaky crust. I love giving gifts to friends and family during the holidays but usually stress about the prospect. Reason being? I want to give meaningful gifts that are personal, affordable and will be appreciated. Phew- So much pressure! Luckily, this year I have my game plan and I'm going green! I've discovered these fabulous, reusable water bottles by Earthlust. Made of food grade stainless steel, these custom designed bottles are chic to carry around and great for the environment. I bought myself this gorgeous 13oz bottle with the tree design and I love it. I will NEVER go back to wasteful plastic water bottles again! The bottles range between $16 and $21 dollars and make a fantastic stocking stuffer. Raise your hand if you've had a crazy last few days. I know I have. And now I sit at my computer, feeling as though I am coming to the end of a chapter that could well be titled: "Meditations on a Full Moon or Madness and all of its Friends". I have a wonderful life- and not without madness, mind you. But the madness that started Thursday evening and ended just a few hours ago was not of the garden variety. Yes, the last few days brought me a mysterious plumbing catastrophe in my home, crazy, feuding neighbors, an almost tribal night of dancing at a friend's going away party and today a children's birthday party that would make the Mad Hatter's tea gathering look tame. And I had to wonder, did any of this have to do with Friday's incredible full moon? When the madness began to happen Thursday evening, I started to resist it but I found it much easier to let go of the paddles and just enjoy the experience like a wild and colorful dream. So to end it on a peaceful note, I am staying in tonight, cuddling up with a new book (that will remain nameless as I am going to review it shortly) and am just going to appreciate a quiet evening at home. Did you survive the madness of the full moon? Oh it rarely happens, but when it does... sheer misery! But at least while I nurse this horrible cold I am in heaven reading the latest book from my favorite author Alexander McCall Smith: The World According to Bertie. This is the fourth installment in the 44 Scotland Street series and it is as enthralling and endearing as the three before it. I'm almost enjoying myself- but don't tell anyone! 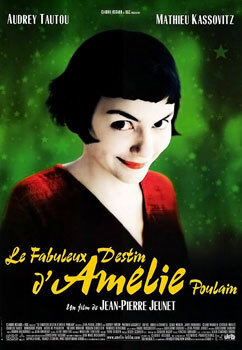 My favorite movie of all time is Amelie or as it is known in France, Le Fabuleux Destin D'Amelie Poulain. I have been smitten with this movie from the day I saw it in a Paris Cinema over seven years ago. 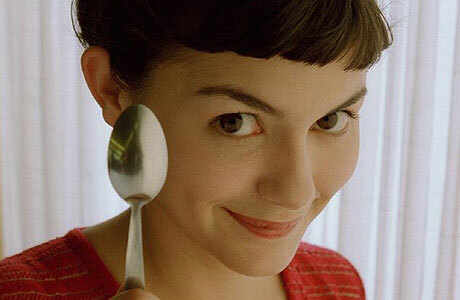 Now, I am definitely a film buff and have many favorites, but no film has ever moved me as Amelie has. Maybe it's because I relate to her so much... who knows? One of my favorite aspects of the movie is how the narrator introduces each character by listing the small pleasures that they love in life. It is, after all, the small things that are so telling about a person, n'est pas? - Walking my dog at twilight. This is my favorite time of day... I love looking at people's living rooms all lit up and seeing the way they live... (in a non-creepy way, of course).